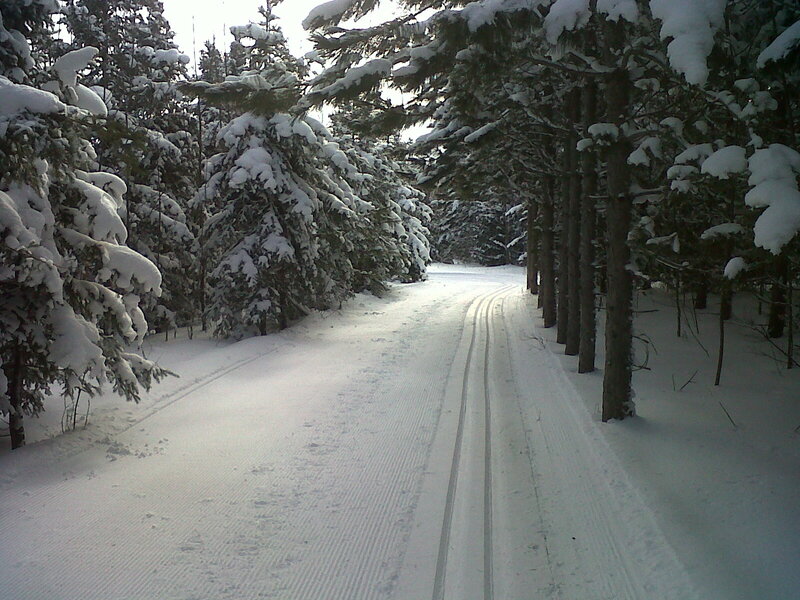 Wooler Place is just down the road from the Highlands Nordic ski chalet with direct access to ski and snowshoe trails. This is a new, very modern facility built to house large groups comfortably. Big windows on both sides of the building look out over the quiet, snowy countryside. “I loved getting up in the morning and having a relaxed breakfast in a large, well-equipped kitchen, then stepping outside to go skiing… no driving!” said Manny. Wooler Place has a very spacious entrance area, and there’s plenty of room for coats and extra gear. It even has ski racks. More photos and a floor plan can be found here. Trakkers is in the process of adding to the January 2017 Wooler booking with an additional weekend, possibly a 3-day trip. Watch for these opportunities next year and book early! This entry was posted in Week-end trips on January 26, 2016 by trakkers. We are delighted to announce that Jennifer Leavitt has re-joined the Trakkers Ski Instructor Team. Long-time members will remember her as Jennifer McCleneghan. In an interview last week, she shared some of her history with the club and what led her to return to the instructor team. I learned to ski when I was 10 years old in Edmonton. I got x-country skis for Christmas. I don’t know if it was the -20c constant in the winter or the fact that the skis were absolutely the wrong camber and length for my frame (I later found out that they were a better fit for someone twice my weight) but I never really enjoyed the sport much in those early days. Maybe I just needed a nurturing environment like Trakkers to reach my true potential. What is your history with Trakkers? I first joined Trakkers in 1992 I was living in Toronto and looking for a way to enjoy winter. I heard about Trakkers, joined, and I loved it right away! My mentors were Sylvia, Xavier, Steve F. and Steve P. They were so encouraging …. before long I was buying better skis and improving. In 1994 I got my CANSI certification and began teaching with Trakkers. The following year, I met my husband-to-be and he came with me to ski with the club. Later, life got messy with 4 kids and although we made a couple of attempts bringing the kids over the years, when we got to child no. 3 it was far from pleasurable. She’s almost 12 now and still claims to hate skiing. I guess you can’t win them all…..
What led you to re-do your CANSI (Canadian Association of Nordic Ski Instructors) certification to teach again with the club? Well, my husband has issues with his knees and my teenagers are no longer willing to ski with me so I was looking for ways to get out with others who are passionate about skiing. I came as a guest last year and helped Steve with his skating class. He mentioned then that if I wanted to come back and teach that Trakkers could use more instructors. I did try to get away with a CANSI refresher but was advised to re-do the whole course. I’m sure glad I did as it had changed significantly in 20+ years and I made some great friends at the course. What do you enjoy most about teaching skiing? 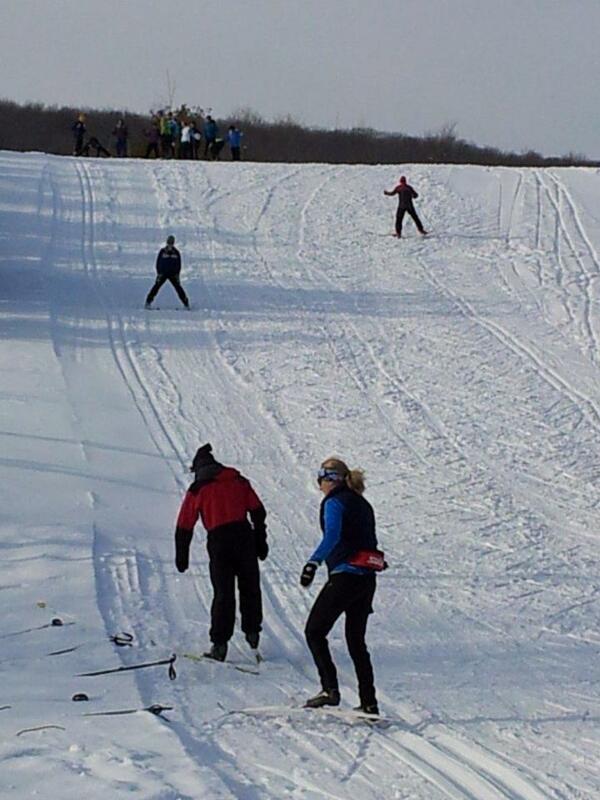 I love experiencing the satisfaction of helping skiers improve on their technique, fitness and skill levels. The look on a student’s face when they get the feeling of a proper glide or when they ski an advanced trail they thought they couldn’t handle is priceless! This entry was posted in Trakker Profiles on January 22, 2016 by trakkers. Here is Celeste’s review of Wasaga, our next destination. Why would anyone wake up before 8 on a Sunday? You are the firefighter putting out a house on fire. 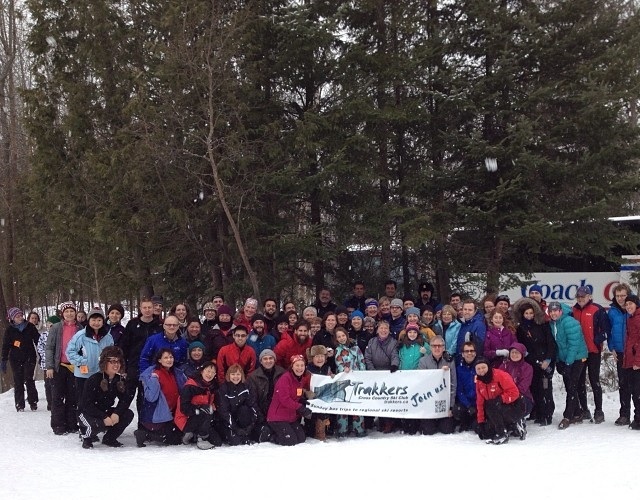 You’re going cross country skiing with Trakkers! This is my third year as a Trakkers member. I came once as my mum’s guest a few years back thinking ‘sounds like fun, I’ll try it out this once and sleep in all subsequent Sundays,’ and loved it so much I rarely ever miss a Sunday of skiing! This week we’re going to Wasaga Beach which has beautiful long sandy beaches, lovely swimming in Lake Huron, and amazing summer fun for the whole family (or at least that’s what the website says). But did you know Wasaga is just as fun in the winter? and, in my opinion, way more beautiful! My favourite thing about skiing at Wasaga Beach Nordic is the feeling of disappearing into a magical white forest right out of a storybook. Getting onto the bus in Toronto and arriving at Wasaga is like going through the magic wardrobe into Narnia. Wasaga has plenty of tiny, twisty, trails that roll along in and out of the forest. They range from gentle, friendly trails perfect for learning and a nice relaxing afternoon ski, to REALLY steep dunes that if you are at all new, perhaps you ought to take off your skis and walk down. But if you do decide to brave the steepest hill, know that it ends in a fairly open field so there is plenty of padded snow to crash into. Wasaga is the cosiest of all our destinations. Unlike most of our places, it doesn’t have a big lunch room so if your timing is off, you may literally share a chair with one of your pals at lunch – all the better to get to know other Trakkers members. 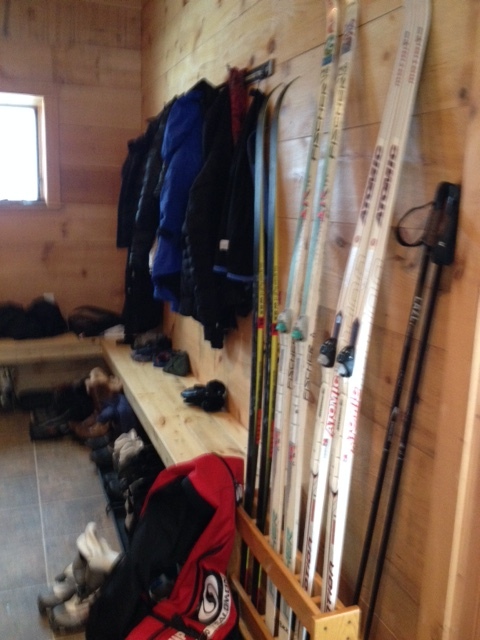 Alternative spots for lunch are the nearby tiny cabin with a wood stove or a ski shelter on one of the trails. Make sure to pack your own lunch. Complete the cozy, magical setting by bringing fresh baked goods to share with me 🙂 and your red cheeked-ski pals (I especially like dark chocolate things). 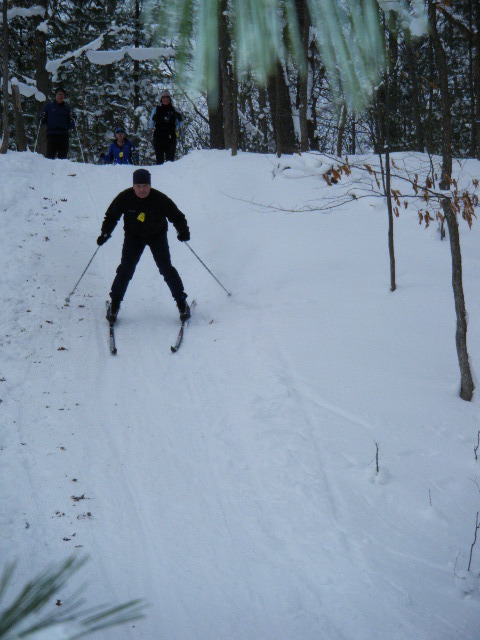 This entry was posted in Sunday Trips, XC Skiing on January 19, 2016 by trakkers. Your snow dances worked — it’s finally winter! Read on for details about our fab photo contest, spots that have now opened up for guests of members for our weekend trips, and more! Reminder – We Need to Know Your Birthdate! All members please note: this year there is a new mandatory requirement under Trakkers’ insurance policy for us to collect date of birth for each of our members. A new field has been added to the member profile page — simply log in to your member account and click on the “Member Profile” link in the My Account section to add this information. Trakkers’ insurance policy is administered under Cross-Country Ontario. Please email us if you have any questions. And on another insurance note, insurance for our CANSI certified instructors requires that each participant sign a waiver prior to taking a lesson. We will soon be providing an online waiver to which you must click on “I Accept” in order to book a lesson. This will be implemented within a few weeks. 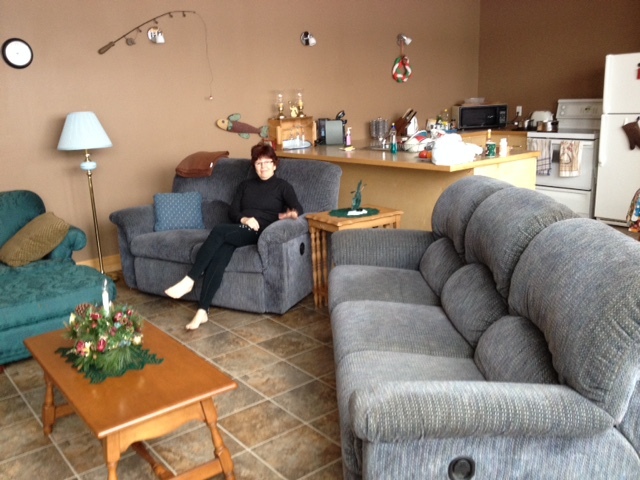 Weekend Trips – One Spot for Woolner House and Guests Now Welcome for Blue Spruce and Pine Vista! Due to a last minute cancellation, there is one spot (single bed) available on this week’s weekend trip (January 15-17) at Woolner Place. Please contact weekendtrips@trakkers.ca if interested. We also still have spots available for both of our upcoming weekend trips to Blue Spruce (February 5-7) and Pine Vista (February 19-21) — and registration has also now been opened up to guests of members who have signed up for the trip. If you know of anyone else who might be interested in joining that trip please invite them along! Blue Spruce is a favourite destination for the club, with two ski areas — Algonquin Park (west gate) and Arrowhead – only a short drive away. Cost per space is $135 each. 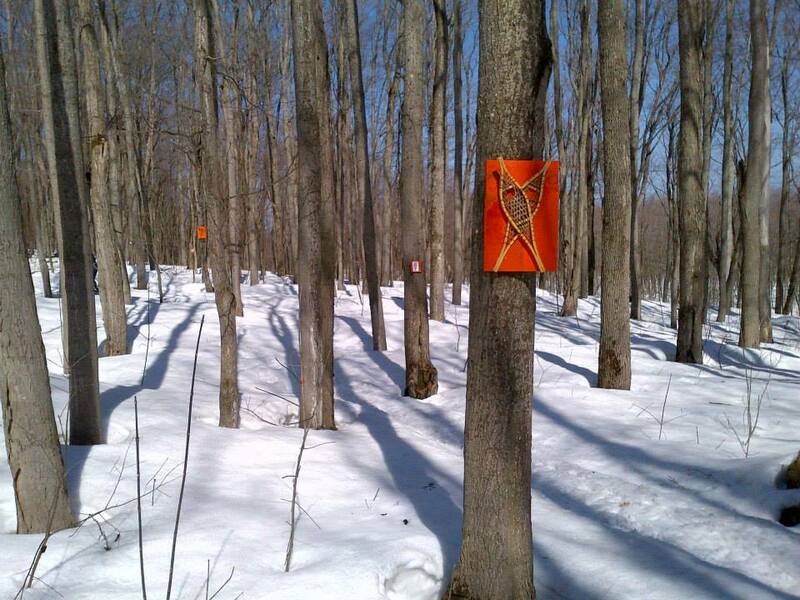 Pine Vista is close to Kawartha Provincial Park and Kawartha Nordic Cross-Country ski trails. Cost per person is $115. Interested? 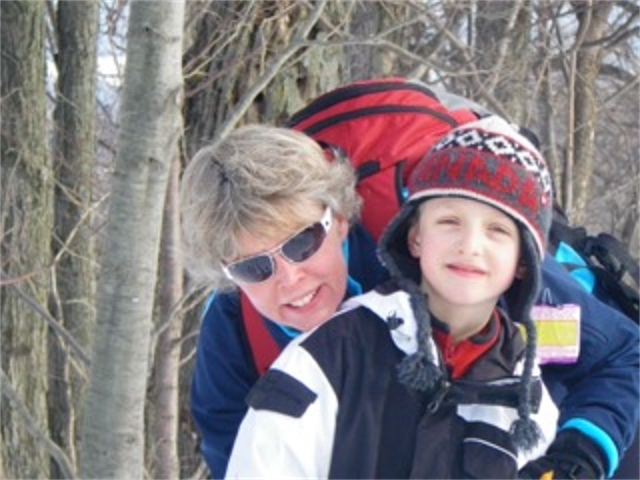 Email Barb Woods, our Weekend Trip Coordinator, at weekendtrip@trakkers.ca, or see more details on our web site. The Trakkers Photo Contest is back and we have some great prizes lined up, courtesy of Mountain Equipment Co-op! This year we’ve chosen a theme for each week’s submission. To participate, Trakkers members can post one photo each week on the Trakkers Facebook page. Members and their friends can vote on any photo by “liking”. Winning photos will be determined based on the number of “likes” received that week. The contest will launch on January 23 (so bring your cameras on the January 24 Sunday trip)! Detailed rules and weekly prize schedule for this year’s contest will be posted to the Trakkers Photo Contest page in the coming days. This year’s wine and cheese will once again be held at Scenic Caves and has been rescheduled to January 31. Come out and join us to toast a great season of skiing. Our Annual General Meeting and Year-End Dinner will be held on Friday, April 1, at Swansea Town Hall. We’ll have a brief ADM/business portion of the evening to start, and then lots of time for a leisurely dinner and socializing! Tickets for the dinner will begin to be sold in mid-February. Official agenda and AGM materials will be posted to the members-only section of the Trakkers web site in late February. 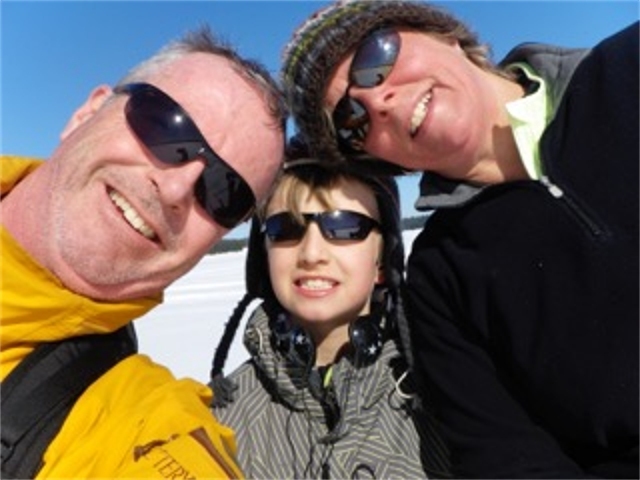 This entry was posted in President's Blogs and tagged cross-country skiing on January 14, 2016 by trakkers. This family-run resort was established by Larry Sinclair and his family in 1992. It’s known for its beautiful views of Georgian Bay, well-groomed trails and high quality services. There’s something for everyone here. 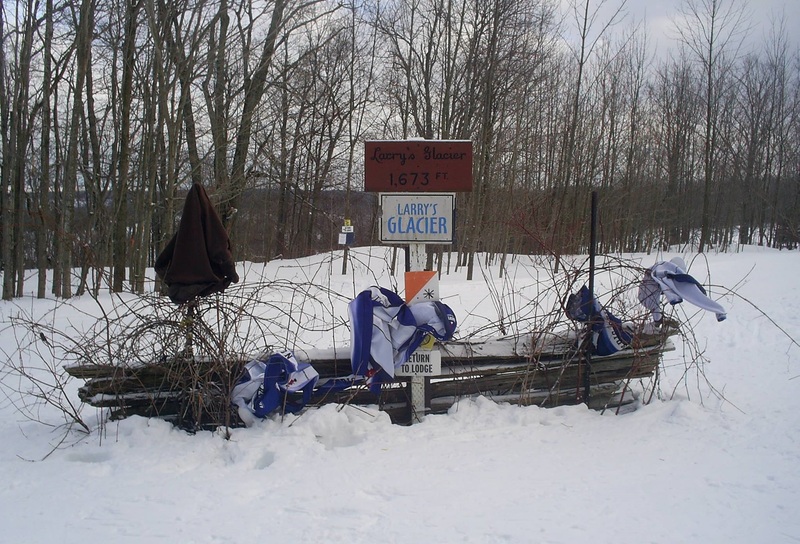 Larry’s Glacier is a favourite rest spot for many Trakker members. Most of the trails pass this junction. Located at the top of a good climb, it offers a place to drop off extra layers if you’re too warm. Don’t forget to pick them up again for the breezy run back down to the lodge! If you want to learn or practice hill climbing and descending, this is a great place to do it. The teaching hill is wide and smooth with plenty of room for lessons. This is a large facility with a number of separate spaces for groups to gather, socialize and store their gear. “What appeals to me is that as a Club, we usually get our own room, away from the hub-bub in the rest of the building” says Bruce. 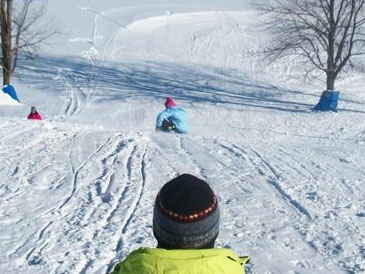 And if the 24 kms of ski trails and 7 kms of snowshoe routes are not enough for you, there’s a separate toboggan hill for some good old-fashioned fun. Something for everyone indeed! 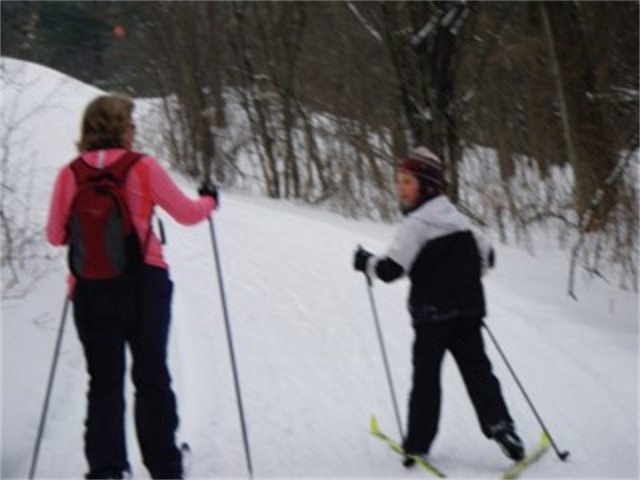 This entry was posted in Snowshoeing, Sunday Trips, XC Skiing on January 13, 2016 by trakkers. 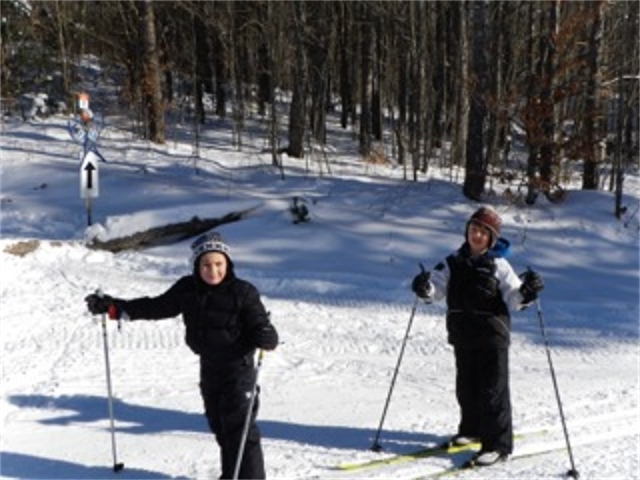 Trakkers welcomes member’s children and provides a series of lessons for kids with activities and games that develop skiing skills and build friendships. Here is a profile of one Trakkers family. What were you looking for when you first joined Trakkers? Allison: We were looking for an activity that the whole family could participate in, at a reasonable cost. Also, as Mark works shift work, it was easy for me to go up on the bus, meet some people, and know that Alec would have some fun without all the stress of driving. We are downhill skiers, but are spoiled and go out west for it. 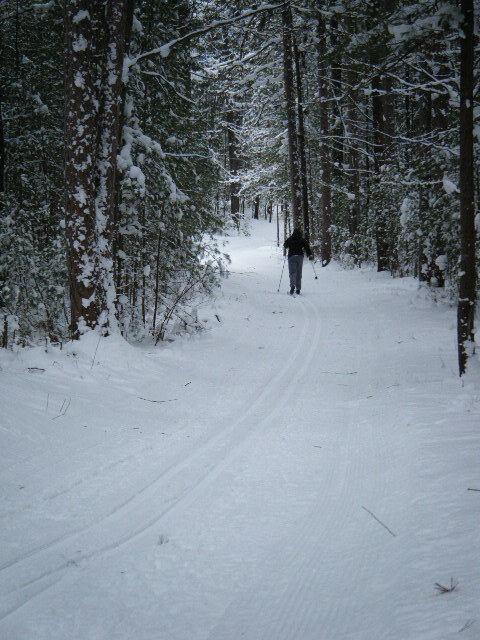 Cross country skiing in Ontario is spectacular and perfect in our forested areas. Can you describe an especially memorable experience you had with Trakkers? Alec: At Horseshoe, I was at the top of a huge hill and from the top, you can see the people getting off the ski lifts for downhill. It was an amazing view and I would go back any day of the week. But the cool part is when I saw what I climbed I was so impressed of what I did! How did your activities with the club change as Alec grew older? Allison: As Alec got older, he was able to come in from lessons and grab his lunch, and I would be able to keep skiing and not worry that he was by himself. He is very familiar with all the trails, and with lots of the members. He is now able to keep up a lot better, his endurance now outlasts mine! He can go out on his own with friends, usually snowshoeing (most of his friends don’t know how to ski) or out with my friends as well. If he has any problems, he is always able to ask someone for help (or he can even help himself). It is great to have all that community support. Do you have any suggestions for other families who have just joined or are thinking about joining? Allison: My advice to any family thinking of joining is – Just do it! It is a great way to spend some time together but also, with kid’s lessons, Trakkers gives you a bit of time to yourself in the morning. There is nothing like exhausted kids at the end of the day! And their rosy cheeks are amazing. This entry was posted in Trakker Profiles on January 10, 2016 by trakkers. All of the resort destinations we travel to have unique appeal. In the coming weeks, we’ll feature reviews by members that point out what they like most about one of the resorts we go to. Here is Jen’s take on Scenic Caves, our destination for January 10. What appeals to you about this destination? I really enjoy the combination of trails, different terrain and scenery at Scenic Caves. The look-out to Georgian Bay from the Lookout Point / Logan’s Run trail is a must-see spot. It’s also nice that most of the trails are quite separate from each other. 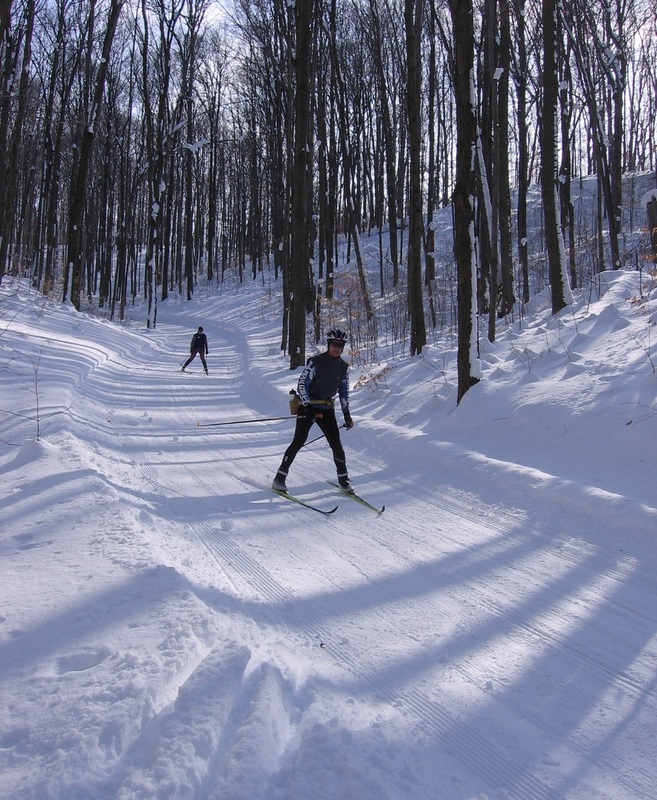 At some resorts, you can easily see many other skiers up ahead of you, or on trails that are running parallel to the trail you are on, but at Scenic Caves each trail feels separate and like you are deep in the forest. At the same time, the resort also has a few natural points where people tend to congregate, as the trails intersect, so it’s easy to meet up with others on the trails if you want. The diversity of the terrain is also appealing. There are lots of hills if that’s your thing, but there are also some trails with flattish sections, like Blue Sky (shown above) or the Northwest Passage. Because Blue Sky is across the road from the main entrance, it always seems to be very quiet. It’s also flat and short, so it’s a wonderful spot to practice your technique if you’re new to skate skiing. What are some features and amenities that would suit different skiers? The resort has clearly put a lot of effort into safety, particularly from the perspective of a newbie skier, which was one of the things I really appreciated when I was just learning. For example, I think that Scenic Caves has the best trail signage of any of the resorts. It seems like at every trail intersection there is a very large, well-maintained map, and all the hilly spots, turns or caution points are well marked. It is simply impossible to get lost there and you always know how close (or far) you are from the chalet or the next trail intersection. That’s comforting! What do you find unique or special? Everyone remarks on how inviting the two log cabins are at Scenic Caves. Each time Trakkers visits we get one of the cabins for our dedicated use, which is really helpful when there are about 100 of us going to the resort! The cabin by the main entrance is handy due to the proximity to the snack bar (hot chocolate! 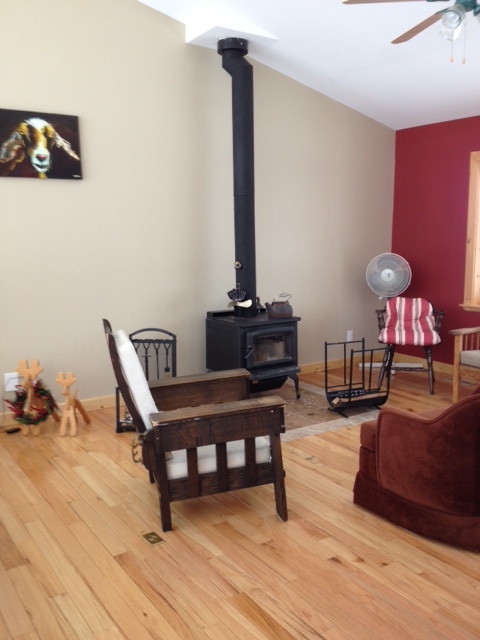 ), but the cabin by the start of the trails is larger and has more couches for post-ski relaxing. 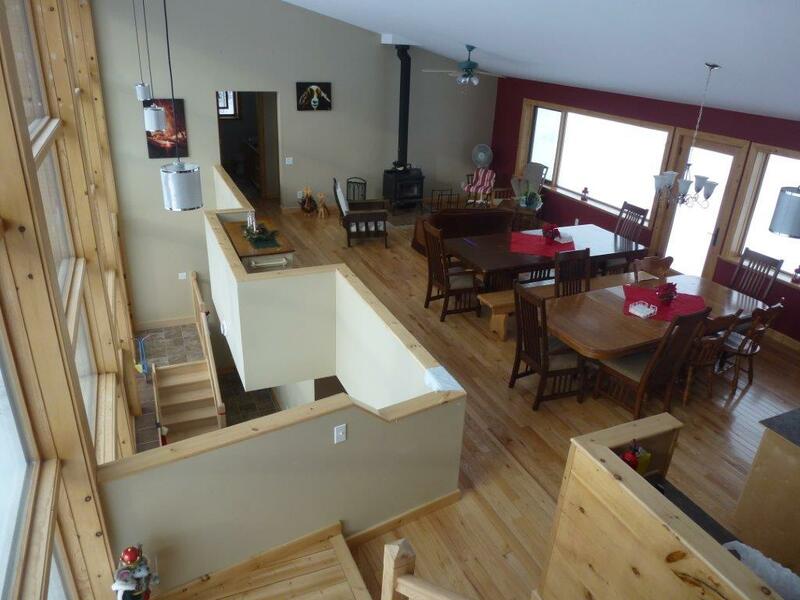 For the Trakkers annual Wine and Cheese on January 10, we have the larger cabin at the trail head booked. Can you describe a memorable experience you had there? The first time I did the Turkey Shoot trail! It is a relatively short (but very steep) short-cut between the trails on the upper level of the resort and the flatter (and more beginner-friendly) trails on the lower level. This was a few years ago and it was also around the same time I realized that I was finally starting to get confidence in my snowplow technique. I actually did the trail somewhat by accident – I had thought I was taking the Georgian Return trail, but then before I knew it there I was, going down the Turkey Shoot and loving it! It was so exhilarating! It also gave me the confidence to try the recently added Murphy’s Stomp trail. Is there anything else a new visitor might like to know? 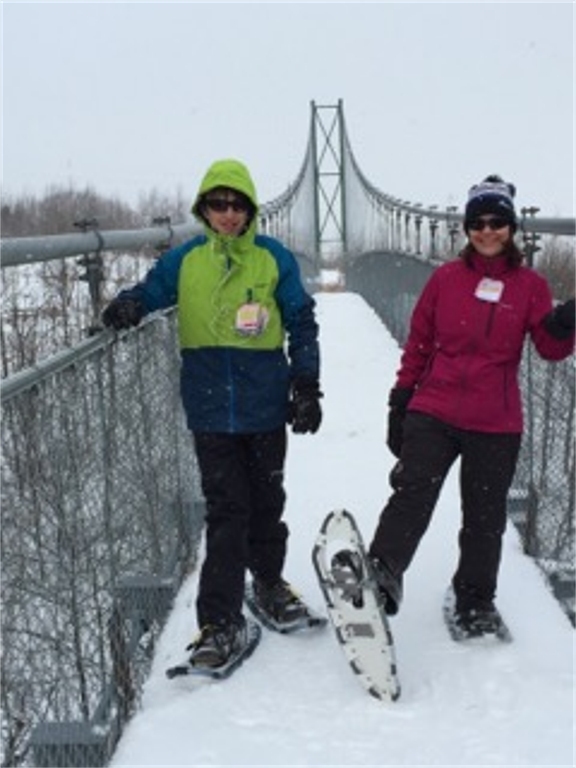 As great as the skiing is at Scenic Caves, the snowshoeing is just as excellent! The Suspension Bridge trail provides a gorgeous look-out across the bay and is a nice challenge to go down the ravine and then back up the other side. If you are looking for a serious workout, the Ironman trail (shown above) can’t be beat. 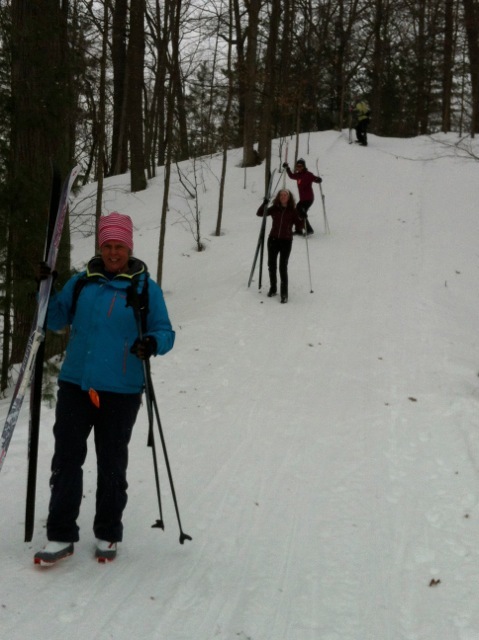 This entry was posted in Snowshoeing, Sunday Trips, XC Skiing on January 4, 2016 by trakkers.